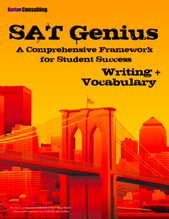 SAT Genius is a professional development program for public high school teachers. Teachers will be familiarized with the world class SAT Genius curriculum, including diagnostic material, extensive lesson plans, workbooks, quizzes, games, and online content. Teachers who pass through the training will be able to teach the SAT in a variety of settings to any student. If your school needs an after-school SAT program, small-group tutoring, one-on-one tutoring or a dedicated SAT class, your teachers will be able to make that happen. The material dovetails with the NYS Regents curriculum, so if your teachers want to work the material into their existing math and english classes, that is a powerful option. SAT Genius was created by a New York City public school teacher, Nicholas Kurian. He noticed that the majority of SAT courses on the market were made for one-on-one tutoring and were terrible in the classroom. He drew on his experience teaching Global History and AP Statistics and created a flexible, fun course that is effective in NYC public school classrooms. After being trained by Kurian Consulting, the creator of SAT Genius, your teachers will be able to teach the SAT as many times as you want. Large test prep companies want to charge your school by the hour or by the course, year after year. Also, the incentive structure of these large companies leads to poor preparation techniques - notice all the useless "tricks" that they market. The only way to improve your students' reading scores is with extensive reading practice; this takes an enormous amount of time, and if a company is paying their employees by the hour, they are certainly not providing the reading practice your students so desperately need. Your teachers can easily do this and while improving their students' ELA scores. Resource-challenged principals have to make tough choices, and SAT preparation for the students often seems like a luxury. The SAT Genius will allow you to kill two birds with one stone. 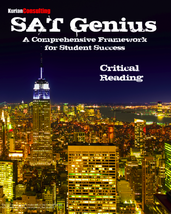 SAT Genius is created with the Regents in mind. 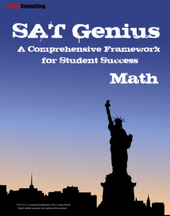 Since the SAT is more difficult than the Regents, preparing your students for the SAT with the SAT Genius will also prepare them for a variety of Regents exams. The test preparation skills that your teachers will learn are universal.